Prime Minister Ranil Wickremesinghe’s decision to award the Central expressway construction contract to the Metallurgical Corporation of China raises a plethora of questions. Prior to the last Presidential polls it was Wickremesinghe and Co. who accused the company of helping some top-notch politicians of the previous Rajapaksa regime to pilfer billions of rupees by inflating the construction costs of expressways. With reference to the above Minister in charge of the subject Kabir Hashim’s memorandum to Cabinet in April 2015 declared that the contract had been awarded in January 2013 for Rs 66 billion, for 9.32 kilometres. He recommended that the scope of the highway be changed. The Memorandum says there could be a substantial saving, but it does not say what this would be. The report on the subject, dated, March 23rd, indicated that, with several changes to the scope (including the omission of one proposed interchange) the contract should cost Rs 41 billion. It also suggested a reduction of 25 per cent in rates. This last point is not mentioned in the Minister’s memorandum. Certainly the report and his Memorandum make nonsense of the claim that the contract should have been for less than 20 billion. This Sub-Committee at a meeting on June 30 gave instructions to submit information at the next meeting to decide on contractors for each stage of what is now termed the Central Highway. Less than a week later the Prime Minister prepared a Cabinet paper in which he said that ‘The government had already agreed that they (MCC) should utilize the savings in OCH3 to undertake construction of a few kilometres on the first section of expressway from Kadawata where the OCH3 terminates’. The Cabinet Paper does not mention the amount of the savings. There is no indication of when or why the government had agreed to these terms with MCC. All this suggests that, far from acting on the assertion in the Manifesto that the Kadawata-Kerawalapitiya Highway was a source of massive commissions to the last government, the new government was determined without following tender procedures, to award yet another contract to this same company. Meanwhile the Secretary to the Ministry who had prepared the frameworks for competitive bidding, was summarily dismissed by the minister. It is interesting to note that the dismissed Secretary Udaya Seneviratne was part of a three member committee appointed by Kabir Hashim to review the former Government’s highway projects. The other members were Faiz Mohideen and M.B.S. Fernando. The committee after reviewing the projects had noted that the cost of several projects were highly inflated and had recommended their continuation on a smaller scale. The Committee had pointed out that the cost of the OCH3 was at least 50% higher than the price based on rates for the Colombo-Katunayake Expressway. The committee presenting their findings had said that the OCH project was awarded to the Metallurgical Corporation of China (MCC) on an unsolicited proposal. When Colombo Telegraph contacted Seneviratne for his views on the new developments with regard to road construction and the reason for his sacking, the former secretary refused to comment on both issues. Meanwhile media reports said that Seneviratne was removed from his position after the Minister Hashim and Deputy Minister Eran Wickremaratne had found that the Secretary was responsible for some serious blunders. It was reported that Seneviratne may have been involved in inserting a Cabinet paper on an unsolicited proposal for a monorail project in Colombo in to the Ministry dossier to be presented at the weekly Cabinet meeting without the knowledge of the Minister or the Deputy Minister. Interestingly, the Cabinet paper had been prepared when former President Mahinda Rajapaksa was in power. 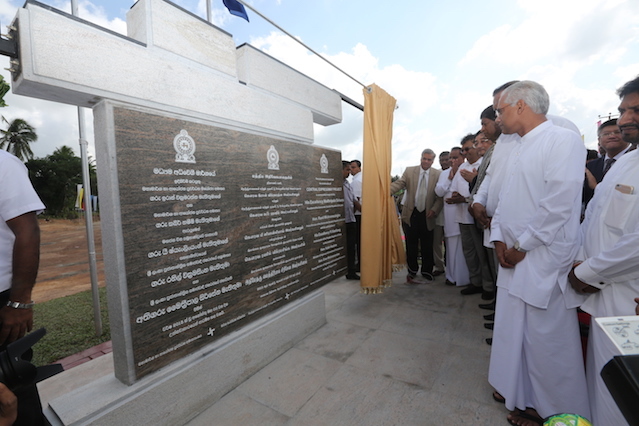 On August 03, construction work on the first phase of the Central Expressway from Colombo to Kandy was launched by Ranil Wickremesinghe at Kadawatha. The first stage of the Expressway will be constructed from Kadawatha to Meerigama. The 2nd stage of the expressway will be constructed from Mirigama to Kurunegala and under the third stage it will be constructed from Kurunegala to Kandy. Constructions will also be carried out from Kurunegala to Dambulla as well. The total distance of the expressway is 98km. Speaking at the event the Premier said that the government had awarded the contract to Metallurgical Corporation of China as the company had agreed to construct the road at a cost which is 50 per cent lower than previous estimate. Soon after this the UPFA convened a press briefing and said that only the estimated price has been changed with regard to the construction of the expressway but the company and the bank had not been changed. Former Minister Dilan Perera said that the Prime Minister had put forward the new cabinet paper instead of an old cabinet paper submitted by the Ministry of Highways. Perera went on to say that Wickremasinghe had pilfered over Rs. 50 billion though the new cabinet paper put forward by him with respect to the Kandy-Colombo expressway project. However Perera did not elaborate on how the premier had done this deed. Meanwhile when contacted the Metallurgical Corporation of China rejected claims that it was involved in inflating costs in relation to any project. A spokesman for MCC said the company was one of the top ten global firms and has completed contracts all over the world with high professionalism and quality. The spokesman said that it was unrealistic to compare the costs of the OCH project with that of Colombo Katunayake Expressway as there were different geographical conditions involved and different requirements. He said that the EXIM Bank had provided the loan after a detailed evaluation. The contradictory details presented by various stakeholders related to the above project raises more questions than answers. More details which will shed new light on the above issue will be revealed in this website in the near future.